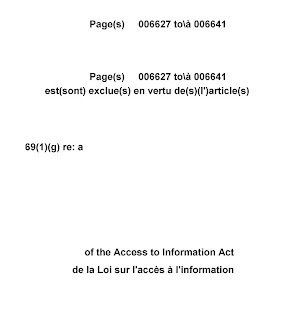 Using tax-payers money, the Canadian Human Rights Commission has finally filed their challenge to the Lemire decision, which found that the thought control legislation of the Canadian Human Rights Act is unconstitutional and a violation of the Charter guaranteed rights to freedom of speech and thought. The CHRC's Memorandum of Fact and Law, will be vigorously challenged by supporters of freedom of speech. Section 13 is Canada's shameful thought control legislation, and a positive ruling by the Federal Court of Canada, will finally end the 33 year reign of totalitarian censorship by the out of control Canadian Human Rights Commission. To date, the Attorney General of Canada, has refused to get involved at the Federal Court of Canada to uphold Section 13. The Attorney General of Canada (assigned to Lemire case by then governing Liberal Party) was active while the case was before the Canadian Human Rights Tribunal, but once the Tribunal ruled the law was unconstitutional, the Attorney General accepted the decision. 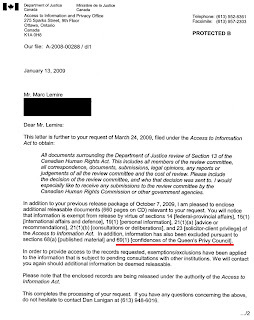 According to an Access to Information request filed by Marc Lemire, in late 2009, the Department of Justice raised the issue with the Prime Minister of Canada and his cabinet. While the actual discussion is censored due to being in the "confines of the Queen's Privy Council" it is clear that the Conservative Prime Minister and his cabinet ruled to not uphold this censorship legislation. At the same time of this decision by Harper government, two separate House of Commons subcommittees were investigating the conduct of the out of control Canadian Human Rights Commission. Now is the time to contact organizations who support freedom of speech and request they intervene in this case, and finally rid Canada of this shameful thought control and pre-crime legislation.